Soi Thai is a sweet restaurant tucked away in Basant Lok between an ATM and Dominoes promising authentic Thai street food (and home delivery). The restaurant is a relatively small but big windowed space with very pretty salvaged wood furniture and not much more going on. The décor includes a collection of (really) questionable art up on the walls and a strange, spotted cow made of tin but the “up for sale” sign makes me hope the choice is commercial and not a reflection of the owners’ taste. 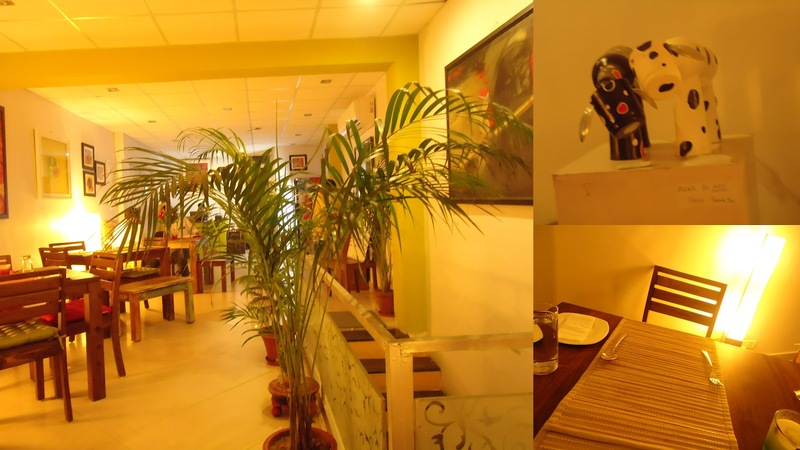 On a brighter note, the place is well lit, looks super clean and has a light, functional charm to it. I’ve always really liked Thai food but the ubiquitous red and green curry menu options which I’m sure has been made of packaged curry paste from Nature’s Basket was getting me down. Soi Thai gives you a lot more choice and even if some of the dishes weren’t as good as they could have been the ingredients were very fresh. We ordered the Tod Man (Fish Cakes) for starters and followed it up with a Phat Krapao (Pork Stir Fry with Basil); Phad Thai with Tofu and Egg and Bamee Phat Ki Mao (Yellow Noodles with Spicy Mix and Prawns). The fish cakes were disappointing, we were expecting something more delicate (in the nature of a crab cake?) but the Tod Man was more like a pakoda. The batter drowned out the flavor of the fish and made the cakes too hard and doughy. It did come with an amazing golden sweet salt sauce though. The Yellow Noodles were well made and the prawns nicely cooked but a little bland – I think the dish would have benefitted from the addition of one strong stand out flavor. 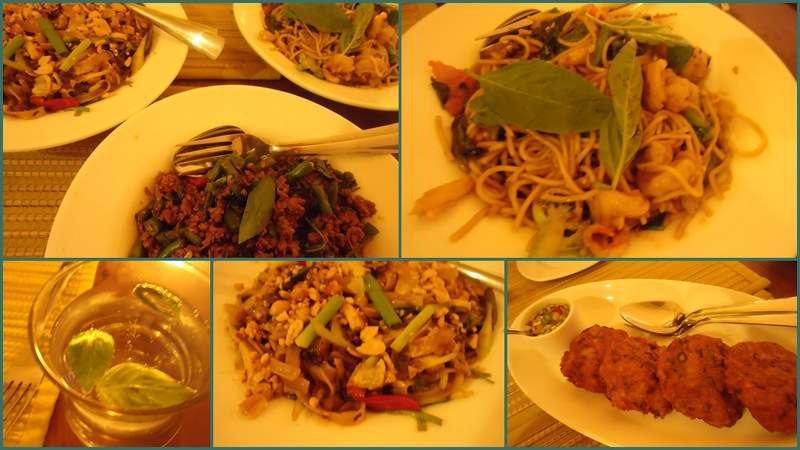 Both the Phat Krapao (Pork Stir Fry with Basil) and Phad Thai were excellent, a lovely combination of complementing light flavors, crunchy greens and perfectly cooked meat. Reviewing Soi Thai is confusing because some things about the food and décor I really liked and other bits just didn’t work. One thing that works unequivocally in favor of this restaurant is the service.